The Organizer’s Find menu in Photoshop Elements is devoted entirely to searching photos. From the Find menu, you can locate photos in collections, catalogs, and the Organizer window according to a variety of different search criteria. To use the commands on the Find menu, you need to have photos loaded in the Organizer window, or create collections or catalogs. When you have a number of different files in an Organizer window from photos shot on different dates, you can narrow your search to find photos, and all other types of files supported by Elements, through a date search. 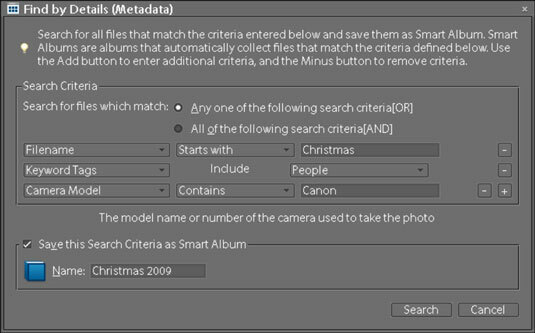 In the Organizer, the date is taken from the camera metadata; but if a date isn’t available from the camera data, the date is taken from the file creation date. Open files in the Organizer by choosing File→Get Photos and then choosing a submenu command for acquiring files. To open files stored on your hard drive, choose the From Files and Folders submenu command. Select a date range by choosing Find→Set Date Range. The Set Date Range dialog box opens. Open the Set Date Range dialog box and specify the start and end dates. Type a year in the Start Date Year text box. Select the month and day from the Month and Day drop-down menus. Repeat the same selections for the end date. The thumbnails shown in the Organizer window include only files created within the specified date range. You can create collections and then select a collection on the Collections panel. Selecting a collection is like having a first level of sorting. You can then search by date or other sort options discussed in the preceding and following sections to narrow the choices. Open files in the Organizer by choosing File→Get Photos and Videos, and then choosing a submenu command for acquiring files. If you’re opening files stored on your hard drive, choose the From Files and Folders submenu command. Choose Find→By Caption or Note. Choose Find–>By Caption or Note to open the dialog box in which search criteria for captions and notes are specified. Find Items with Caption or Note: In the text box, type the words you want to locate. Match Only the Beginning of Words in Captions and Notes: Click this radio button when you know that your caption or note begins with words you type in the text box. Match Any Part of Any Word in Captions or Notes: Click this radio button if you’re not sure whether the text typed in the box is used at the beginning of a caption or note, or whether it’s contained within the caption name or note text. The Results appear in the Organizer window. Elements keeps track of what you do with your photos, such as printing, e-mailing, sharing, and performing a number of other tasks. You can search for files based on the file history by choosing Find→By History. Selecting options on the By History submenu reports files found on date searches meeting the history criteria. Metadata includes information about your images that’s supplied by digital cameras as well as custom data you add to a file. Metadata contains descriptions of the image, such as your camera name, the camera settings you used to take a picture, copyright information, and much more. Choose Find→By Details (Metadata) in the Organizer. The Find by Details (Metadata) dialog box opens. The first two groups in the dialog box offer a number of different choices for search criteria and options according to the criteria. In the third column, you specify exactly what you want to search by typing search criteria in the text box. Choose Find–>By Details (Metadata) in the Organizer to open the dialog box in which metadata are specified. If a magical method is available to you for searching files in Elements, it has to be searching for faces. When you choose Find→Find Faces for Tagging, Elements searches through files you select in the Organizer window and examines each image for a face — Homo sapiens faces, to be exact. Note that you should first select image thumbnails in the Organizer window and then choose Find→Find Faces for Tagging. If you don’t select files, Elements searches the entire catalog. Be aware that if you search through a large catalog, Elements takes some time to complete the search.